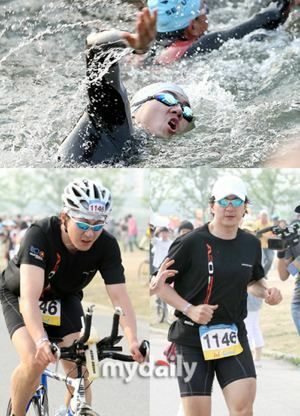 Song Il-gook participated in Seoul's '2008 Seoul International Triathlon Competition' as an athlete, and he swam (1 km), cycled (40 km), and ran (10 km). He said, "I participated without breakfast. It's fun to challenge yourself". "Song Il-gook 'From Jumong to iron man, triple attempt'"
Kim Tae-hee-Song Seung-heon, a kiss of love!